Fond as I am of both the East London Line and murals, I'll be sorry to miss the London Mural Preservation Society's walk next Saturday 30 June. If you're in London, you might like to go along. The walk/ride begins at 11am at New Cross station and ends three hours later in Dalson Junction, with a pub stop along the way. It's led by the LMPS founder Ruth Miller and takes in more than ten murals including New Cross's Riders of the Apocalypse. For more details, contact info@londonmuralpreservationsociety.com. Paris got the Eiffel Tower in 1889. Within months, a competitor in London was being planned. It didn't quite happen - but came very close indeed. The impact of the Eiffel Tower was everywhere in this scheme. 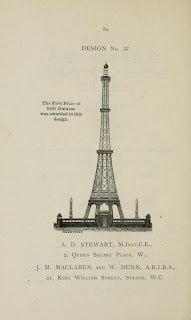 Indeed, the preface to the book of designs began One of the objects of greatest interest in Paris is The Eiffel Tower, which is situated in the Champ de Mars. Only two and a half pages later is the prospect of a tower in London mentioned. Many of the ideas are somewhere between bizarre and insane (a tower of vegetarians feeding themselves from hanging gardens - which didn't make it into the published collection; a non-leaning Tower of Pisa). 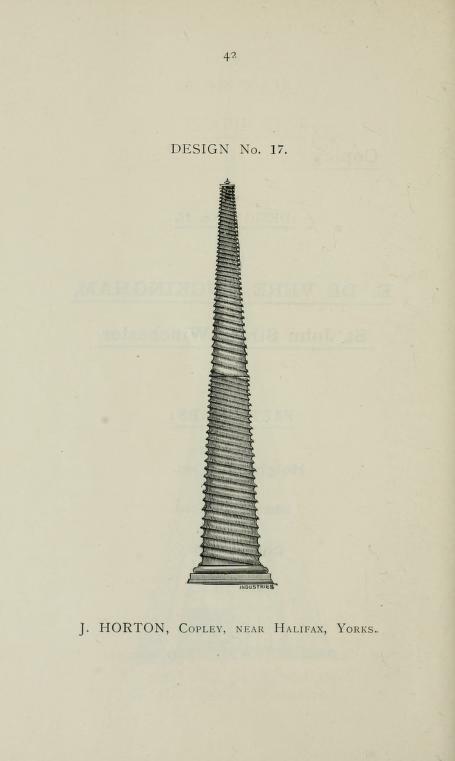 Perhaps more intriguing are those which are peculiar but just within the bounds of insanity, such as J Horton of Yorkshire's giant screw. Pedestrians could walk all the way up the corrugated-steel spiral, which would have soared 1,200 feet into the air, or take a tram halfway. A 1,550-foot steel gothic design -with spiral steam railway - might seem equally unlikely, but it earned Max am Ende an honourable mention (though no prize money). The winning design, by Stewart, Maclaren and Dunn, didn't actually inspire much enthusiasm in the judges. 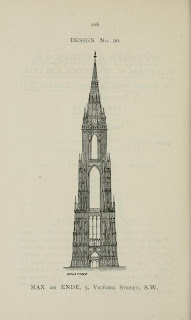 (Perhaps its most significant features were the height - 215 feet taller than the Eiffel Tower - and octagonal shape, giving more sides than the Eiffel Tower.) Nonetheless, building got underway for the ambitious structure which would house exhibition halls, dance halls, theatres, restaurants, and even turkish baths. 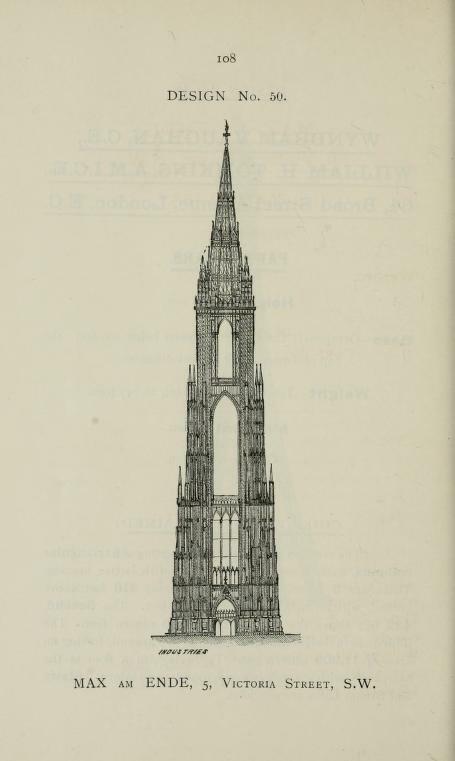 To give a sense of its scale, the Great Tower was to have been 180 feet taller than the Shard. There was only one problem: money. 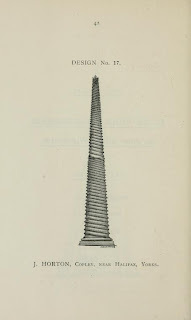 The French government had subsidised Eiffel's tower, but there would be no such help for Watkin. Funding by public subscription didn't work, so Watkin's company was bearing the full cost. The design was modified to be shorter and four-sided, and by 1896 its first floor was not only built but open to the public. Then disaster struck: the weight of the iron structure was already so great that the foundations shifted. There was no more money, so construction would go no further. The truncated structure remained open until 1902, but was unloved and neglected. It attracted the nickname 'Watkin's Folly' long before it was finally closed for reasons of safety. In 1907, the ill-fated structure was demolished (its concrete foundation would later be covered by the more-famous football pitch). 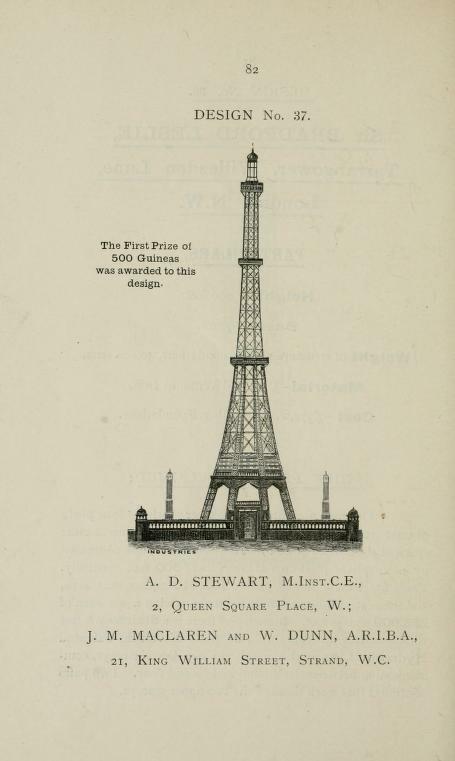 The pre-eminence of the Eiffel Tower had not been seriously challenged after all. Images (top to bottom): J Horton's design; Max am Ende's design; the original winning design by Stewrd, Maclaren and Dunn. 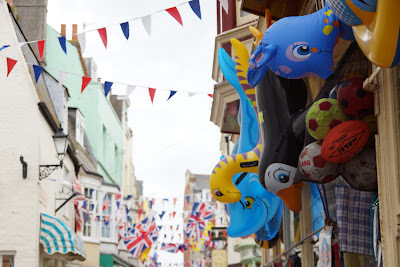 When I visited Weymouth recently, the juibilee bunting was still decorating the streets. However, previous jubilees have left more permanent marks on the town. The first glimpse of the seafront for those arriving by train includes a rather fine clock. 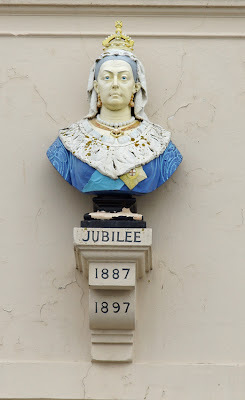 It commemorates Queen Victoria's golden jubilee of 1887. In typical Victorian municipal style, John Groves, Mayor is also mentioned on the inscription decorating each side. In fact, the clock pre-dates the Esplanade, and originally stood on the beach itself: the Esplanade was built around it in the 1920s. Four lamps were also added, but have since been lost. The colourful cast-iron clock looks particularly glorious at the moment after being repainted last year. A smaller private tribute still adorns the facade of the Fairhaven Hotel. 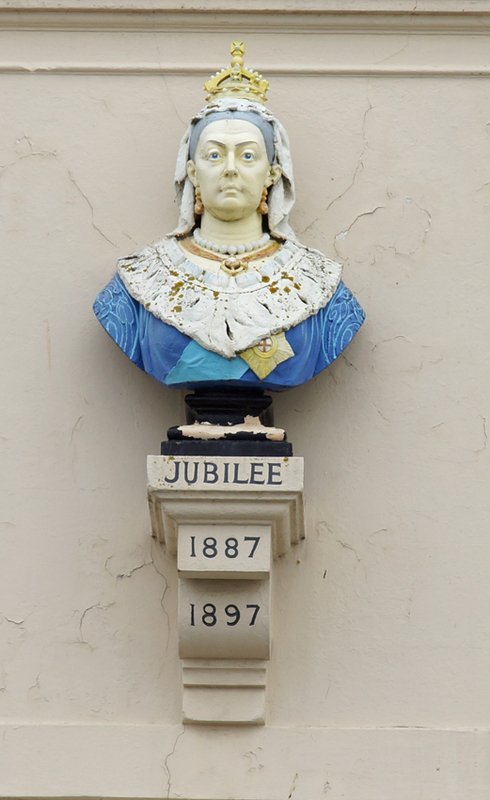 In a clever piece of economy, the date '1897' was added to the bust's plinth to mark the Diamond Jubilee at almost no extra cost. 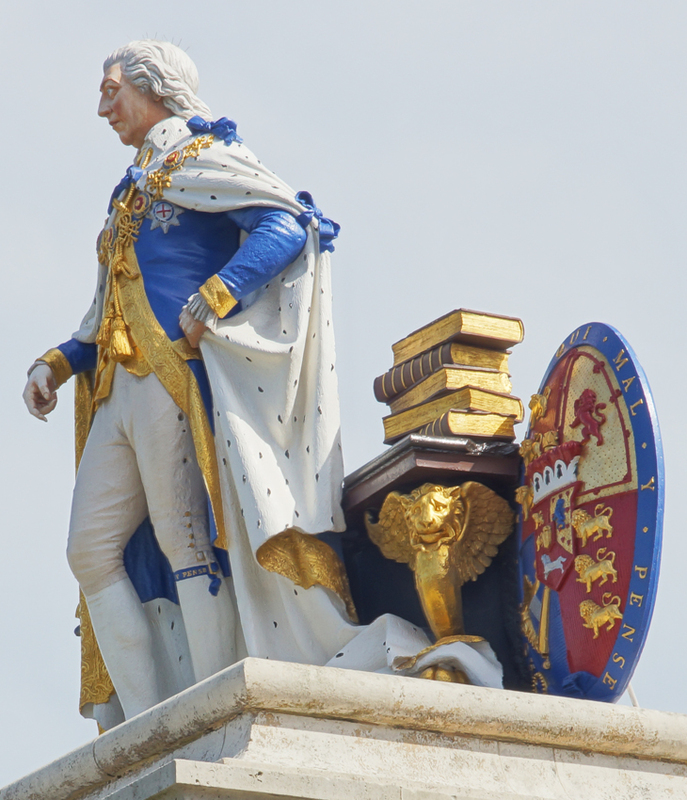 However, the finest piece of jubilee memorabilia is even earlier: the magnificent King's Statue which commemorates the golden jubilee of George III. It is, quite rightly, a local landmark. Although it stands on a Portland stone plinth, the figures are of Coade stone. There are lots of colourful details to note; I particularly like the pile of books which remind us that before he became stereotyped as 'mad', the king was a noted scholar. His King's Library formed a basis for the British Library. 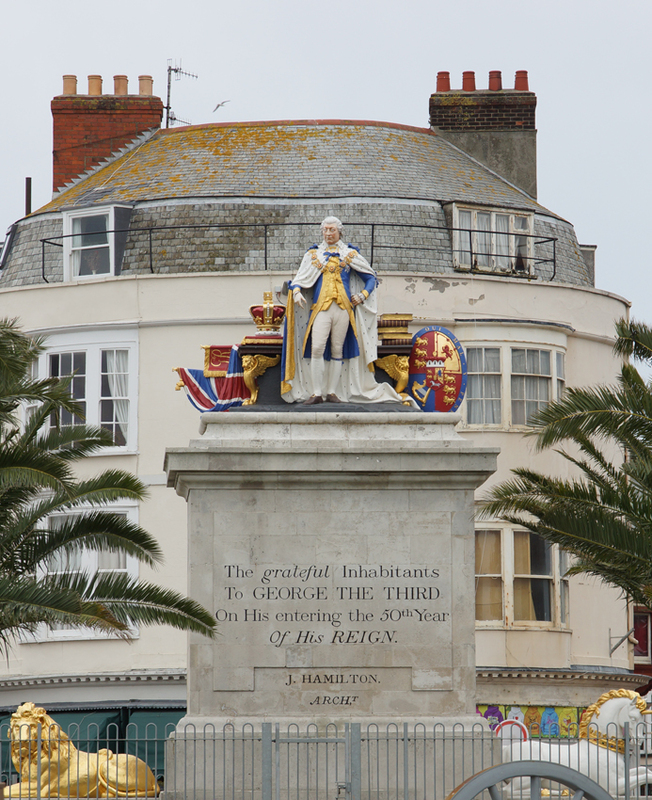 The statue marks his golden jubilee, in 1810 - also the year in which declining health made him accept his son becoming Prince Regent. Weymouth had good reason to celebrate him, since he took his holidays there, helping to establish its popularity as a seaside resort. Although he did not attend the unveiling, other members of the Royal Family including the Prince of Wales were present. Again, the limelight on the inscription is shared - this time with its designer, architect James Hamilton. He was also responsible for the town's Royal Crescent and the white horse at Osmington - an equestrian depiction of George III - as well as several now-demolished chapels. Since my earlier post on local reaction to the BBC programme Secret History of our Streets, and its representation of Deptford, a new website has been created. Deptford: putting the record straight deals with the programme's claims in detail. There is also a leaflet which can be downloaded. The image on the plaque is accurate rather than flattering: an elderly woman with strong features carries a small basket and holds a pamphlet. The words below are full of affection, though. 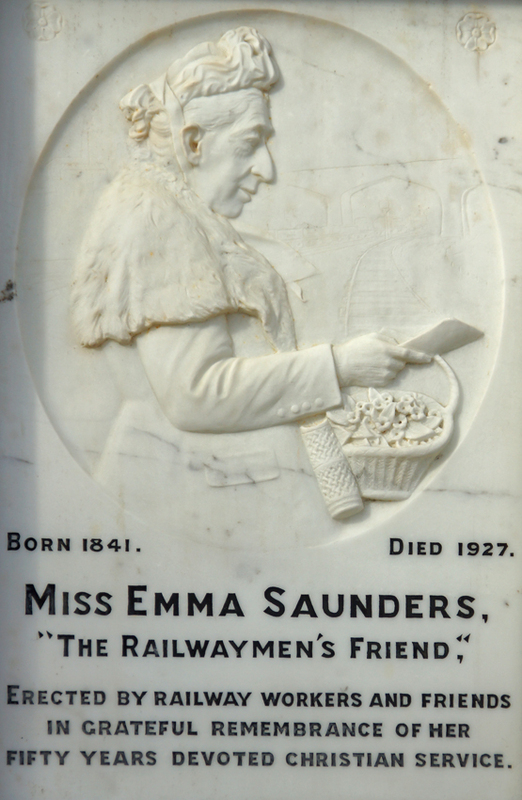 Miss Emma Saunders is described as 'the railwaymen's friend', her memorial 'erected by railway workers and friends in grateful remembrance'. 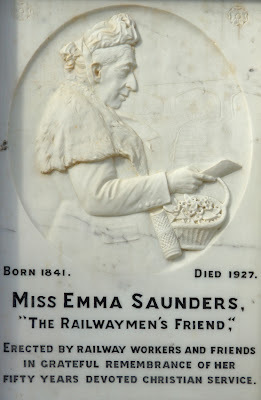 Emma Saunders was born in Manchester but as a small child, moved with her family to Bristol. She spent her life in charitable work and in 1881, aged 40, took on the work which occupied her for the rest of her life. Miss Louisa Stevenson, head of a mission to railwaymen, became ill and asked her to take over. Henceforth she devoted herself to working with rail staff in Bristol. She and her team visited staff with religious literature and small gifts - her basket holds the small bunches of flowers she sometimes gave to men; other presents included hand-made lavender bags. She also visited their families - often out of general concern but sometimes to break news of men's deaths. Saunders believed in temperance. Her missionary role expanded when she became concerned about young workers coming to Bristol and facing the temptations of public houses. She worked hard to provide a range of alternatives in her Bristol and West of England Railway-mens' Institute, including a canteen, billiards and skittles facilities, and engineering classes. Her efforts were recognised in 1921, when she was presented with an illuminated address, settee and armchair for her eightieth birthday. Over 5,000 railway staff had contributed to the gifts. In 1927, Saunders died. Over a thousand railwaymen attended the funeral and wore a daffodil in her memory. 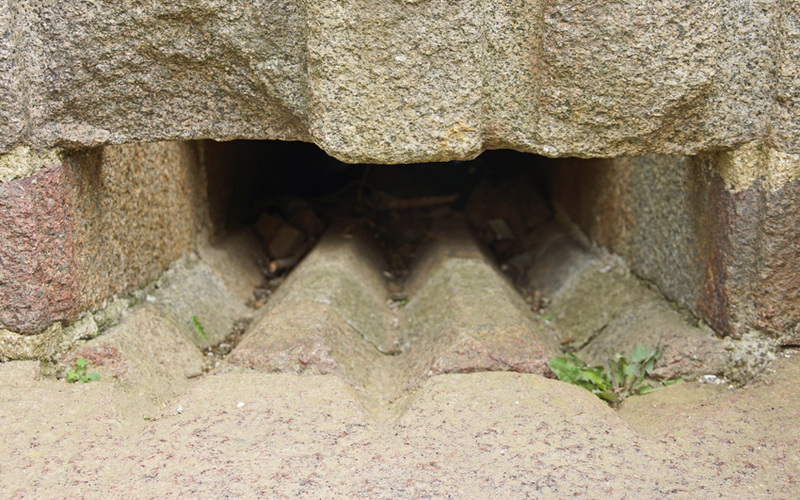 On the clifftops above Saint Brieuc, Brittany, is a curious stone structure. 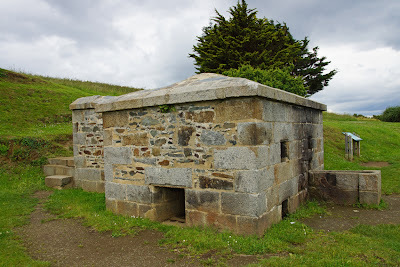 In fact, it is a reminder of naval warfare between Britain and France. The device is a cannonball oven, intended to heat the missiles in the hope that they would set enemy ships on fire. 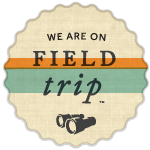 Designed in 1794, it was staffed by five men. The first was responsible for the fire which burned in the left-hand part of the structure. Wood was fed in through the upper opening, while the lower provided ventilation. 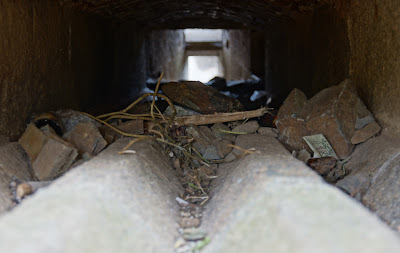 A third opening in the side wall allowed ashes to be removed. 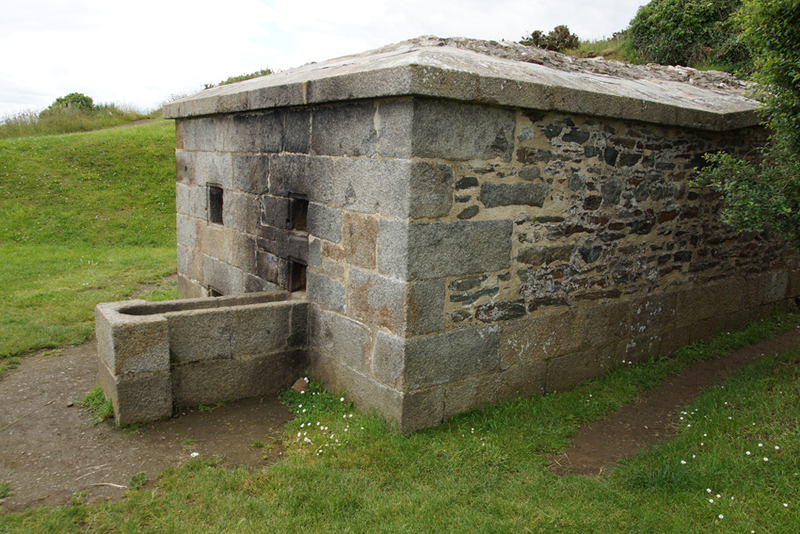 When the fire was going well, a load of 20 cannonballs would be sent down into the oven through an opening at the back. They rolled down three channels to a flat metal area where they would sit in a bowl for two-and-a-half hours until they turned red-hot. The process could be supervised from the upper right-hand opening. Once ready, the cannonballs exited by the lower opening. They were quickly carried in a large, metal 'spoon' to the nearby cannon, already prepared with a charge of gunpowder. It would be fired, and the hope was that if it reached its target then it would not only damage it, but set it alight. A few months ago, I mentioned the People's Building Society which has left this fine plaque in Lewisham. There was little information to add beyond that it was operating in the 1860s and in 1968 made an application to be merged into the Greenwich Building Society. However, today I chanced across an advertisement for the organisation in Nathan Dews' History of Deptford of 1883. Like so many text-heavy Victorian adverts, it is full of information. 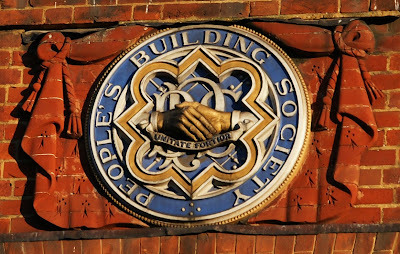 The society's name at that time was the People's Co-operative Permanent Building Society, more informative than catchy. The chief office was in Greenwich Road, but there were branches both in Woolwich and in the Mechanics' Institute on Deptford High Street. None of these branches opened more than one evening a week. The services offered by the People's Co-operative sound attractive. Money invested in £50 shares received 5% compound interest added yearly, with annual bonuses after two years; 4% was paid on smaller deposits, calculated monthly. According to the society, THIS IS ONE OF THE BEST AND MOST LIBERAL BUILDING SOCIETIES EXTANT FOR BORROWERS. As for lenders, they could obtain money 'advanced immediately' to purchase freehold or leasehold property. 'Solicitor's and Surveyor's charges are moderate', and a loan of £100 would be repaid in a tempting 16 years. Why buy, though, in a city where most people rented? The answer was a combination of financial prudence and a promise akin to that of modern buy-to-let: while RENT PAYERS ... give away ONE SIXTH of their income, or ONE DAY'S LABOUR EVERY WEEK to their landlords, for the prudent homeowner, As soon as a member redeems his mortgage the Rent of the House will secure to him an ANNUITY FOR LIFE. These financial services must have appealed to many south-east Londoners. The building society boasted an annual income of £60,000 and claimed to have lent over £450,000 in the thirty-five or so years since its formation. Leaving your litter on the beach is rightly frowned upon. However, some of the smaller visitors to Val Andre this Easter had left plenty of debris behind! At first glance, someone appeared to have dropped plastic packaging below the high tide line. In fact, the bubbly white substance is a cluster of whelk egg cases. When laid, they would have been attached to a stationary object such as a stone. 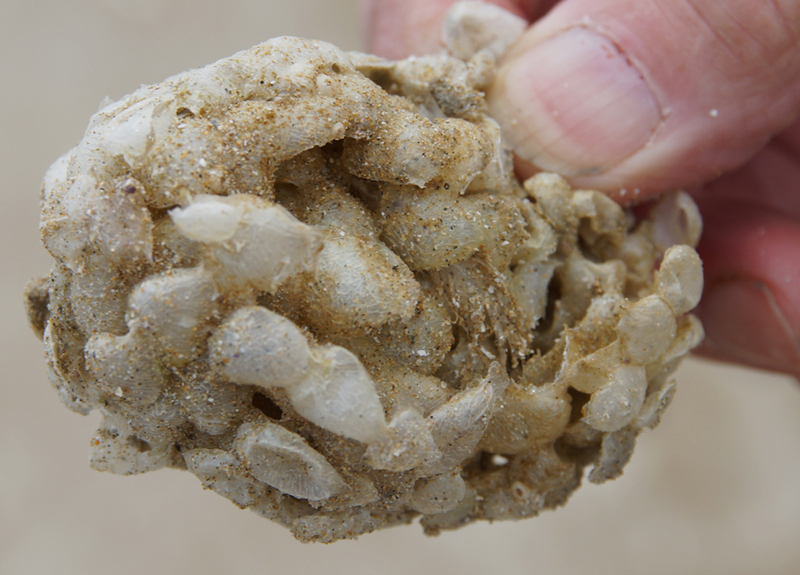 The whelks have since hatched - and those who emerged ate unhatched sibllings as their first meal. The empty case then became detached and washed onto the shore. 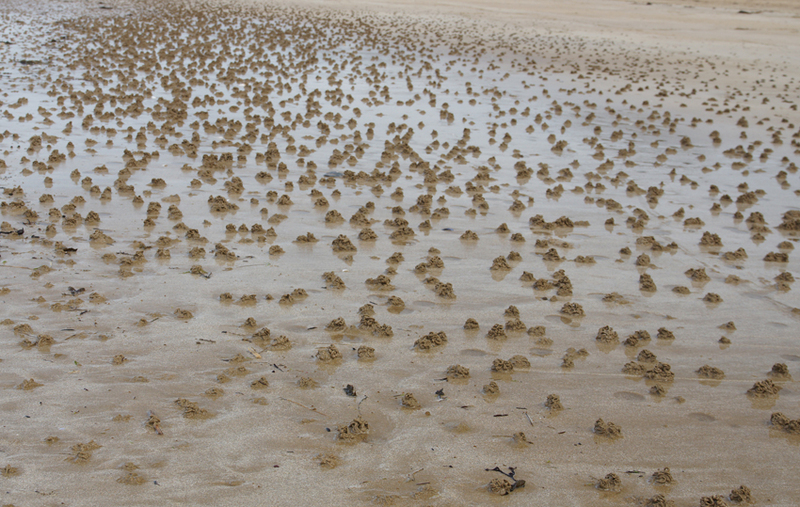 More obviously natural were the lugworm casts scattered across much of the beach. These worms feed not on siblings but on sand, digesting anything edible and excreting the leftovers in these little piles. 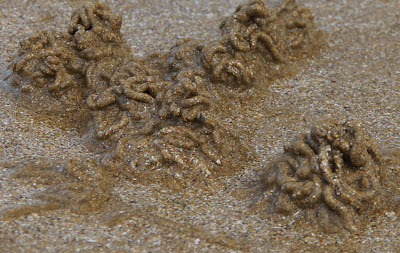 Dips nearby mark the points where their mouths are taking in sand. 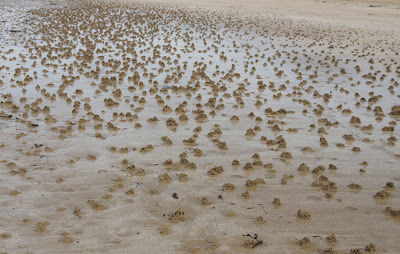 They are a popular fishing bait, but I left the worms (which can be up to six inches long) undisturbed in their sandy U-shaped burrows. The Secret History of our Streets: Deptford High Street, shown on Wednesday, has attracted a lot of local attention. It told a compelling story, and an important one both for reminding us of the human cost of such development schemes and for understanding how today's Deptford was shaped. There has been a range of responses expressed on Twitter, on the BBC's website, and in local blogs. Generally, the reaction to the key part of the story - the often-unnecessary demolition of terraced housing and the effect on those whose community was broken up - has been positive. 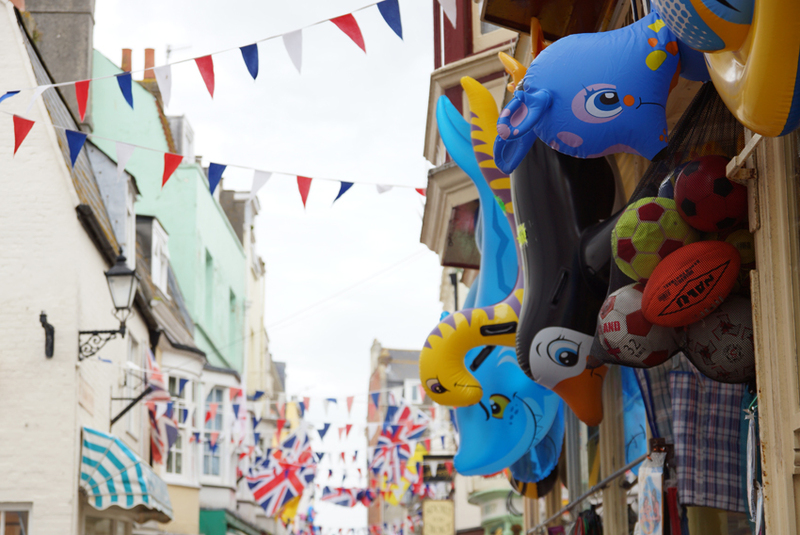 However, various reservations have been expressed by local viewers, particularly about whether ex-councillor Nicholas Taylor was portrayed fairly, and about the way the modern High Street is depicted. For a thoughtful analysis of the first issue, see this Crosswhatfields? post. The second issue is addressed by The view from Nunhead Station and Brockley Central. (Updated: and by Deptford Dame.) Many of these points resonate with me: some time was given to depicting the area's present in a way which doesn't reflect reality. As well as the pound shops and betting shops (and goodness knows there are too many of the latter), Deptford has thriving grocers' and butchers' shops, Caribbean bakeries, Asian supermarkets, an independent hardware store, restaurants, cafes and pie-and-mash shops, theatre, library, art galleries, the beautiful St Paul's Church, and much more. In painting a simplified picture of an area which went into sudden and irreversible decline, the programme did us all a disservice. In particular, its association of that decline with the arrival of immigrants made me uneasy. It's ironic that having established how town planners falsely painted a negative picture of the area, the programme-makers went on to do the same. As Deptford continues to face challenges from developers and others, we need to counter that by showing there is something worthwhile here which shouldn't be damaged. Viewers of the programme might struggle to believe it. As I waited for my train at Chester, I passed the time with a cup of coffee. A century or so ago, I might have chosen hot chocolate instead - just along Brook Street at the charming Railway Cocoa Rooms. Today they have been transformed into a bar, which we will see to be somewhat ironic; however, their appealing signs remain. The building dates from 1880. An advertisement from the late nineteenth century shows that it was one of four establishments owned by the Chester Cocoa House Company (Limited). Not only that, but they opened from 5am until 11pm. The latter feature is a clue to the purpose behind the business: cocoa rooms were intended as temperance alternatives to the pub for working people. Sensibly perhaps, the Chester company did not rely solely upon thirsty working men for custom but also emphasised its availability for 'picnic and school parties ... with or without notice'. It's easy to laugh at the temperance movement, with its earnestness and its sometimes improbable alternatives to the pub. We should remember though that many of those active in the cause were motivated by a genuine concern for the effect of excess alcohol upon people's lives. It was not pleasure they objected to, but violence and the impoverishment of families. 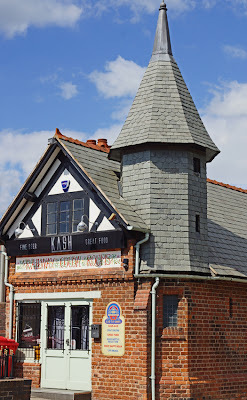 They also did more than condemn: endeavours such as cocoa houses and billiard halls aimed to offer real options to the public house and the gin palace. The Chester premises have all suffered the fate of most temperance endeavours, closing down in the first half of the twentieth century. One suspects that the business loss would have upset their founders less than the fact that many, such as this one, are now drinking establishments. 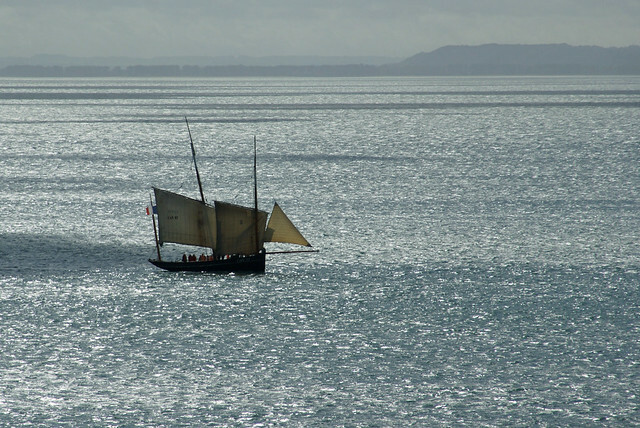 Local to the Bay of Mont St Michel, the bisquine fishing boat was designed for its shallow waters and treacherous tides. Its large rigging helped make it both powerful and manoeuvrable, with a long bowsprit allowing the jib to add stability. (The masts could take up to three sails each, although the uppermost seems to have been used mainly when racing.) These characteristics were perhaps most important during the Easter Caravan, the short and heavily-regulated season for fishing wild oysters. Local pride, rather than economic survival, was at stake in annual regattas where the bisquines of Cancale raced those of Granville. Boats were carefully prepared for these occasions, which were at their peak from 1895 until the First World War. The competition was fierce, with collisions frequent, and didn't end when the sailors returned to dry land: the prize-giving sometimes ended in a fight! As well as the oyster-fishing for which the area is famous, bisquines were also used for trawling and line-fishing. They first appeared around 1810, their name referring to the origins of this style of boat in the Bay of Biscay, and a century later there were several hundred sailing in the bay. They lasted well into the twentieth century but after the Second World War their numbers quickly declined. It seemed that the bisquine was extinct - until La Cancalaise and La Granvillaise were built in 1987-1990.